Taekwondo will improve your focus. Taekwondo, a Korean martial arts, literally means the "art of hand and foot." It differs from other martial arts in that there is not a focus on using weapons and body throws are not taught. 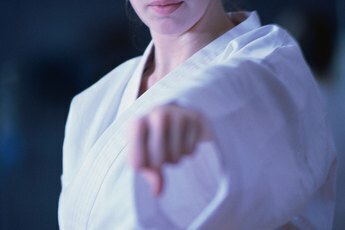 Taekwondo techniques are effective for defending yourself against an attacker in realistic situations. The combination of mental and physical discipline make it an attractive practice to undertake, no matter your age. 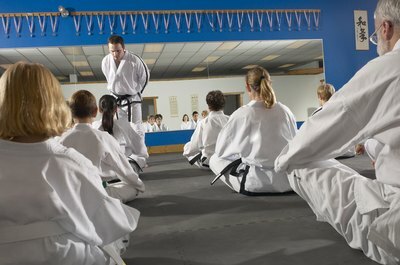 The first objective of students of taekwondo is to learn and understand it as an art and sport. In addition to learning the basic tenets, students learn the physical movements that develop their strength, balance and coordination. Taekwondo is meant to be a lifetime sport, allowing participants to be as active as possible no matter what their age or condition. It develops the participant's confidence and sense of achievement, according to Calgary Taekwondo as well as the ability to compete. Training in taekwondo requires both mental and physical discipline. Modern Grand Masters of taekwondo philosophy advocate the sport as a way to form a good moral character, non-violent attitudes and behavior, according to Calgary Taekwondo. Channeling aggression in a positive way and continuous challenge is an important goal in taekwondo. The University of Notre Dame reports that perseverance, courtesy, self-control, integrity and indomitable spirit are the five tenets of self-discipline in taekwondo. Courtesy and integrity are essential for both self-respect and respect of others. Self-control is the ability to resist aggression unless absolutely necessary and the indomitable spirit is that which embraces the discipline and challenge of a lifetime of learning in taekwondo. Taekwondo movements are not meant for attacking, but rather for using the hands and feet as weapons for defense. The tactics are not meant to cause harm, but rather deflect and neutralize an aggressor. Counterattack movements such as blocking, sparring, kicking, jumping, throwing and falling are all essential components. Jiptjung is a significant part of self-defense training, where breathing is used to combine force and energy. University of Vermont: Why Tae Kwon Do?